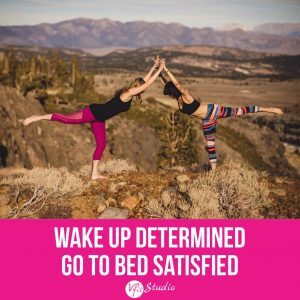 Today we are talking about your daily END game… which is to go to bed each night feeling SATISFIED… ACCOMPLISHED and like you made the MOST of that day. And while everyday may not always be counted as a total WIN, this is the attitude we build ourselves up to strive for day in and day out! You only get this ONE shot at life, don’t take one single day for granted. So how do we aim for this feeling of satisfaction each night as we hit the pillow? It takes going backwards a bit to that moment when you FIRST WAKE UP. It has been proven that the most successful and HAPPY people out there, have a solid morning routine! It just makes sense. How can you run the day, if you can’t even start your day on the right foot? Here at VFit, we are firm believers in a solid morning routine to kick off each and every day. If you set yourself up for success in the morning, that success trickles and multiplies throughout the rest of your day. // Meal and exercise planning each Sunday, so that for each day of the week ahead, you have prioritized and set aside time for your workouts, have set up your menu for food and have all the things stocked that you’ll need (we’ll dive deeper into this for next week’s inspo!). Your schedule isn’t the same week to week, you need to take time to sit through what your upcoming schedule is going to look like, and PLAN accordingly. Planning doesn’t need to be high tech, take a long time, or be complicated. It just has to happen! A plan starts your day in action! There will be no extra need to think about what is for breakfast/lunch/dinner, when you are going to fit in your workout, or other day to day decisions that if left unplanned, lead to decision overload and where most fall off track. This simple weekly ritual will give you time to see your week at a glance, and take time to work around what is on your schedule coming up. // Setting aside the clothes you will wear the next morning, so that decision is made. Again, decison overload is a real condition and the more you can set up in your pre-game, the better off you’ll be at LIFE. Setting out your clothes (workout and work/day clothes) is like a standing date you won’t want to let down! // NEVER EVER, EVER, ever hitting the snooze alarm. Ever! Sounds harsh, but we are FIRMLY ANTI-snooze around here. Snoozing is wasted time in your precious day on every level. Set that alarm for when you need to actually wake up, and do yourself the favor and wake up on that first alarm. The ‘extra’ zzzz’s you get after hitting the snooze are poor quality, won’t bring any benefit to your day, and often times just leave you oversleeping and regretting all the things you now missed or need to rush to catch up. Set that alarm across the room, make it your favorite song, do whatever you need to do to just GET UP on this first try. Bonus high fives for yourself when you conquer this ritual, the fact that you did something hard right out of the gates and that is just getting out of bed! // Chug a large glass of water first thing! This wakes up every system in your body like a good ol jump start and gives your body a nice hydration boost – gearing it up for the day ahead, awake, and ready to MOVE! This is one of the most most simple and effective tips you can do to improve your health – we promise! // If you are a coffee drinker, invest in a machine that you can set the night before. Then when you come on down to that kitchen, your coffee is ready and waiting for you. Or whatever your morning drink of preference is in the morning – make it a ritual and enjoy it. Have everything you need to make it on hand and set out for you the night before. // Find something you LOVE, something that makes you feel good, and do it EVERY morning. For us, it may be no surprise to you, but it’s getting in an early bird workout. Working out early takes you from reactive to PROACTIVE, it sets your mind straight, gets your intentions ready for the day, and exercise releases FEEL good hormones into your body. We call it hooking up to an IV of happy juice and productivity. It should feel darn goooood to take care of yourself and make yourself a priority. Because you should be. Every day! But this morning ritual can be anything that fills your cup. Bible study, inspirational readings, listening to a podcast, journaling, a brisk walk – just take 10-30 minutes a morning for YOU! That may mean waking up earlier, but once you realize what a gift this is to your life, you will start waking up the second that alarm goes off – we mean it! Doing something for YOU, that makes YOU feel fulfilled before the world comes at you with its demands, is one of the MOST AMAZING gifts you can give yourself. We believe so strongly in the importance of early bird workouts that we have our schedule jam packed for both coasts to get them in each day of the week (and slightly later on the weekends). So there you have it, our top tips for ending your day with satisfaction. It all starts with how you wake up. What are some things that work for you in the morning to help you get your day set off on the right foot? Would you like to take the #earlybirdchallenge and sign up for some early classes this week? If so, we’ve set aside free week passes to the first 5 people that claim them below. To activate your pass, simply sign up and show up for your first class by Wednesday! Hope to see you in class with us and that when your head hits that pillow, you are feeling satisfied and your heart is full! Rachele, Maria and the VFit team! Take 10 – Where Will You Take 10?